From barber poles to limburger cheese, these 5 companies are the last left in America making iconic products now in their twilight. Barber poles may be a fading icon, but they're still a family business for Bob Marvy (right) and his three sons. The red-and-white poles that adorn barber shops may be iconic, but they're fast fading into a nostalgic relic. William Marvy Company, the last known manufacturer in North America of the poles, typically sells 500 of them each year, down from 5,100 in the company's late-1960s heyday. Bob Marvy, a second-generation owner of the St. Paul, Minn., company, dates the industry's slowdown back to an unlikely source: The Beatles. The Fab Four and their trendy mop-tops ruined it for barbers, he thinks. Men who previously went to barber shops weekly for their clean-cut looks started waiting two or even three weeks between trims. Competition from cheaper poles out of China and Japan also added pressure, putting three other U.S. manufacturers out of business. 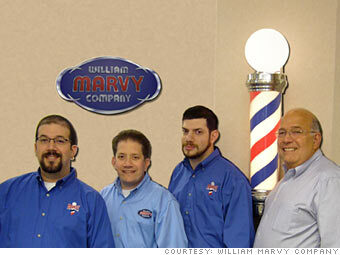 That left William Marvy as the last American barber pole maker in the business. The 74-year-old company has diversified to survive. It now sells other items of barber nostalgia, as well as sanitation systems for combs, brushes and manicure supplies. The company also gets a significant chunk of business from antique dealers and collectors needing repairs on old poles. "We now make parts for almost every barber pole that's ever been produced," Marvy says. "It's a small business, but we keep working at it."